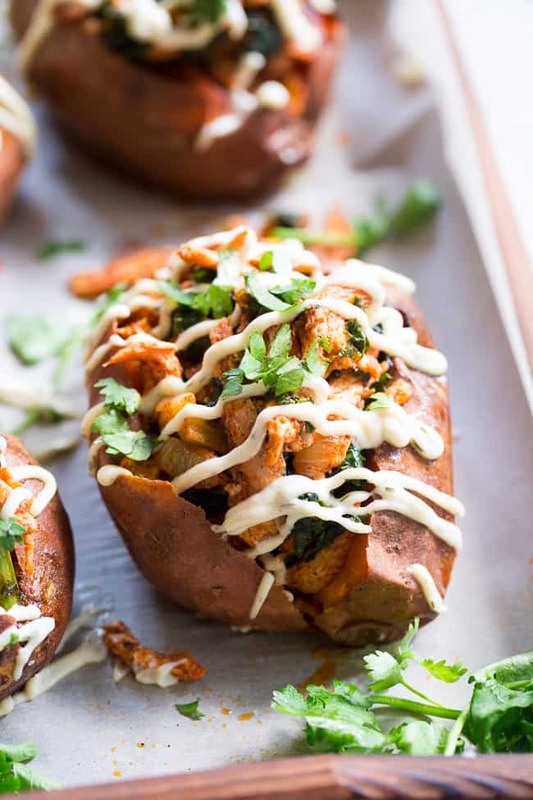 Saucy, flavor-packed shredded chipotle chicken is stuffed into baked sweet potatoes and topped with an easy homemade ranch! 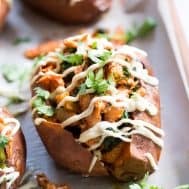 These chipotle chicken stuffed sweet potatoes make a tasty and filling Paleo and Whole30 compliant dinner that you can easily prep ahead of time. 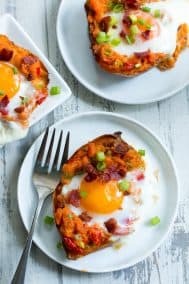 Can we just eat stuffed sweet potatoes for breakfast lunch and dinner every day? They’re just about my favorite thing in the world. All the years I wasted pre-paleo NOT eating stuffed sweet potatoes! But not to worry – I’m doing a pretty good job of making up for lost time. 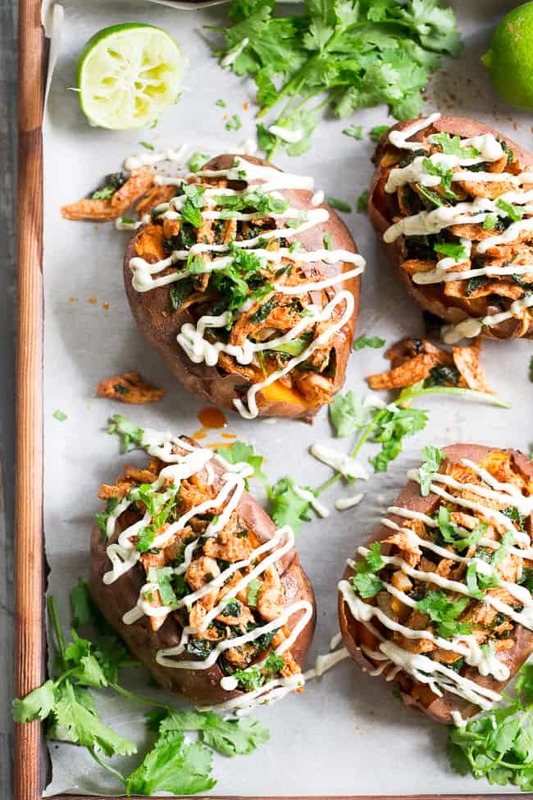 Whether we’re talking twice baked breakfast sweet potatoes, sloppy joe stuffed sweet potatoes, or chicken pesto stuffed sweet potatoes, there’s just something so satisfyingly perfect about all my favorite goodies stuffed into my favorite root veggie – the sweet potato! For today’s version, we’re getting spicy! Shredded chipotle chicken with tons of flavor and even some greens snuck in there – in the form of kale! Because if there’s one thing I love even more than sweet potatoes, it’s the combination of sweet potatoes and kale. Now trust me – this recipe is delicious just as you see above, with the saucy chicken, garlic, onions, and sweet potatoes. But I decided to take them one step further, because I just couldn’t help it! If you’re like me and love the combination of spicy things with cool ranch, you’ll definitely be on board with my topping of choice – an easy homemade ranch sauce! Yup, there it is below – the finished product. The ranch I make is mayo based, so I highly recommend using a mayo you really love – whether it’s homemade or purchased. If you haven’t tried my fast and easy immersion blender mayo yet, now is the perfect time! It’s great with so many recipes and the base for so many of my Whole30 compliant sauces, dips, and dressings. 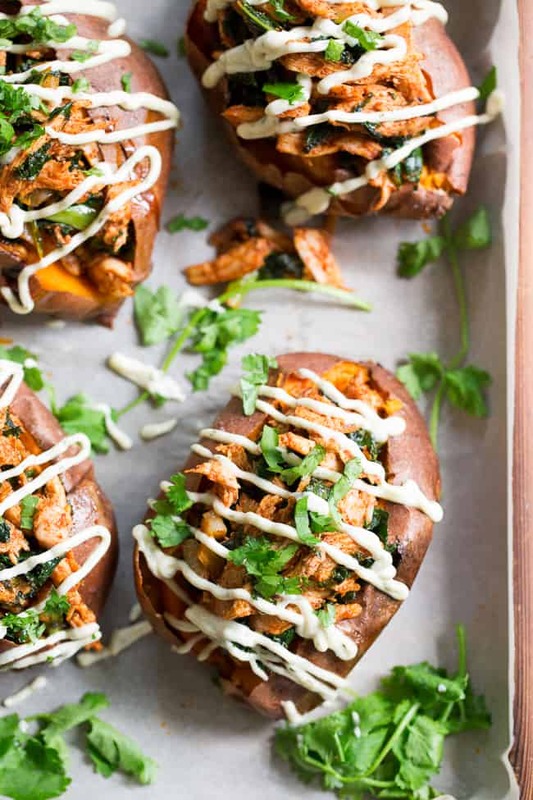 These stuffed sweet potatoes are perfect for weeknight dinners because you can do almost all the prep work ahead of time! Pre-bake the potatoes, cook the chicken and sauce, and then just heat and assemble right before serving. It makes a great lunch option too! I’d say we’re ready to get on and make this recipe! Simple, so tasty, and minimal prep time – all the things I love in a good meal! Grab an apron (that sauce’ll stain!) 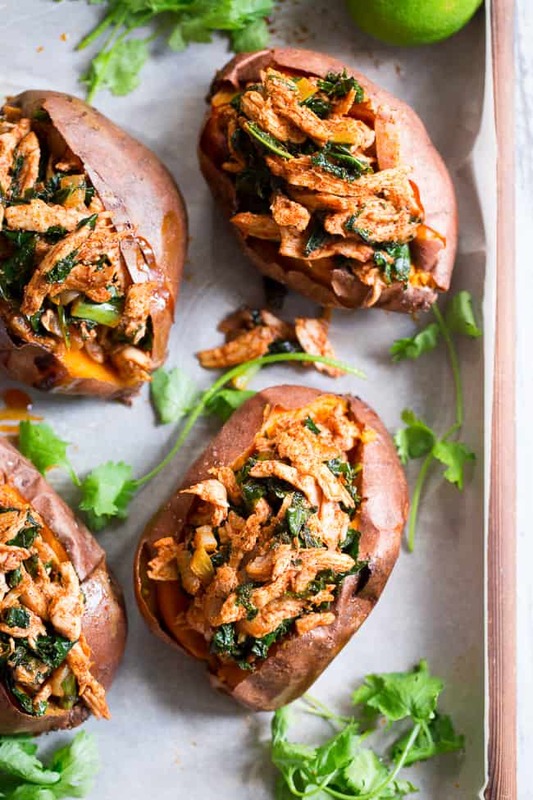 and grab those sweet potatoes – we’re ready to party, Whole30 style! 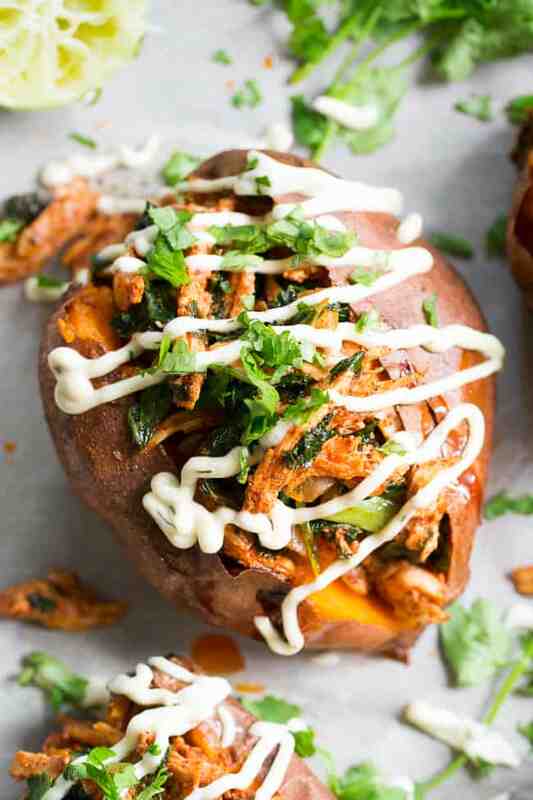 Saucy, flavor-packed shredded chipotle chicken is stuffed into baked sweet potatoes and topped with n easy homemade ranch! 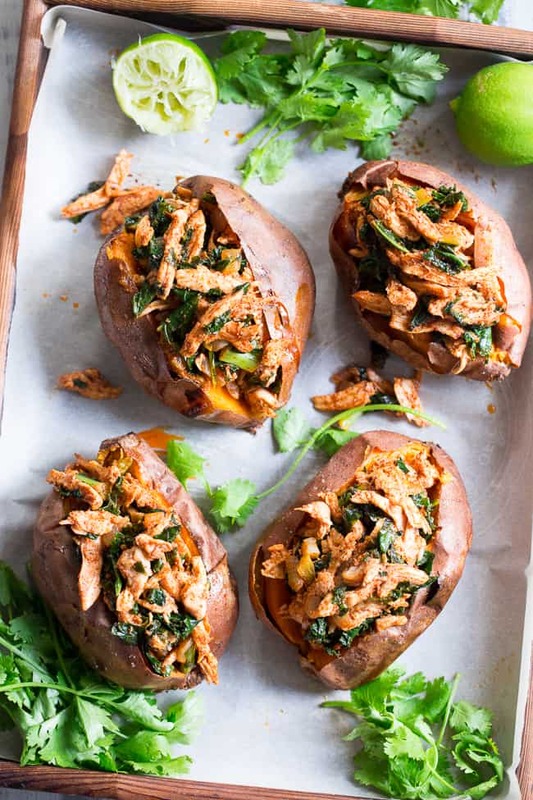 These chipotle chicken stuffed sweet potatoes make a tasty and filling Paleo and Whole30 compliant dinner that you can easily prep ahead of time. If you plan on making the ranch, do so before beginning and refrigerate until ready to serve: whisk together all ingredients in a small bowl, cover, then refrigerate. Preheat your oven to 425 degrees and line a large baking sheet with parchment paper. Scrub your sweet potatoes and dry well, then rub the outsides lightly with coconut oil and sprinkle with sea salt. Pierce with a fork to let steam out. Place on the baking sheet and bake in the preheated oven for 45 mins - 1hour or until insides are soft. While chicken and potatoes bake, heat a skillet over medium heat and add cooking fat. Add chopped onion and cook until translucent, then add garlic and cook, stirring, anther 30 seconds until softened. Add all the chopped kale and sprinkle with salt. Stir to coat with oil and then cover skillet to soften, until wilted. Uncover and stir, lowering the heat to avoid burning the garlic and onions. Once kale is sauteed to preference, remove from heat and make the sauce. Whisk all spices together with the lime juice in a small bowl. While continuing to whisk, slowly pour in all the oil until fully combined, then set aside. Shred the cooked chicken with two forks, then add to the kale mixture. Give the sauce a whisk and pour all over chicken and kale. Heat the skillet to medium and cook, stirring another minute until heated through. Cut each potato in half lengthwise and divide the chipotle chicken mixture evenly between the potatoes. Top with the ranch and garnish with cilantro. Enjoy! 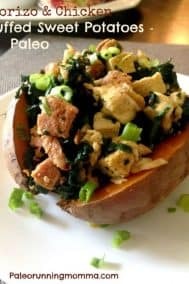 Want More Whole30 Lunch and Dinner Recipes? Try One of These! I don’t have Chipotle powder, but I have Chipotle Chili powder – would that give the same flavor? Nice dish to share, this is very delicious and very tasty. Its an incredible joy perusing your post. It’s brimming with data I am searching for and I want to post a remark that “The substance of your post is amazing” Great work. Easy and delicious! I used a Whole30 compliant rotisserie chicken so it was even easier! This has a great flavor. 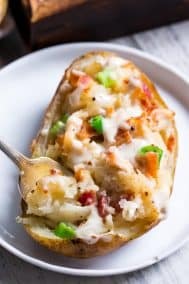 I substituted a regular potato for my husband but I loved the sweet potato. Thank you so much for all the great recipes. The ranch topping really adds a zing. This was a total hit at my house! Even the pickiest eaters enjoyed it. I love anything with sweet potato, and the chicken and ranch all went perfectly together. Awesome recipe! Awesome. I don’t care much for sweet potatoes but my husband loves them. I can’t wait to make it again!